Diplomats from the US and Cuba said progress was made Friday during negotiations that aim to restore relations between the nations. Delegates discussed embassy openings, prisoner exchanges and Cuba’s place on the US list of state sponsors of terrorism. US assistant secretary of state Roberta Jacobson, and Josefina Vidal, chief of the Cuban foreign ministry's US division, led the respective delegations in talks held in Washington throughout Friday morning and afternoon. They followed the first round of discussion held on January 22 in Havana. During the meetings, Cuba pushed the US to remove it from its list of state sponsors of terrorism, with Vidal saying the issue is a "priority" for Cuba. She added to Reuters that it would be "very difficult to say that we have re-established relations with our country still on a list that we believe very, very firmly that we have never belonged to and we do not belong to." However, Vidal stated that removal from the list is not a precondition for renewing diplomatic ties with the US. The Obama administration is reviewing Cuba’s place on the terror-sponsor list – a designation established in 1982 for Cuba’s aid to Marxist insurgencies – though to be removed from it, the US Congress would have to approve the move. 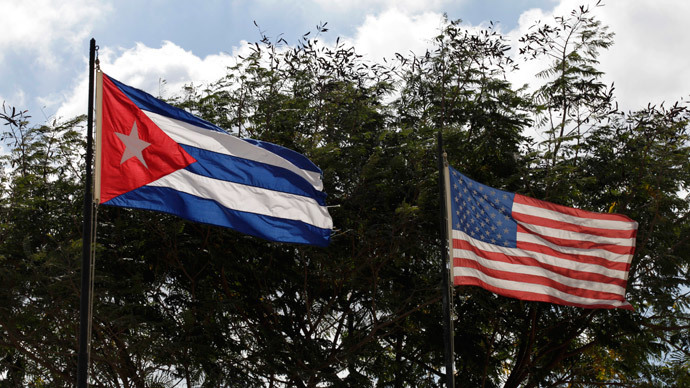 The US has also stated that the issue of removing Cuba from the list should not hold up other efforts to restore ties. Meanwhile, Jacobson said the US is hoping to reach an agreement with Cuba on reopening embassies by the Summit of the Americas in April, where President Barack Obama and Cuban President Raul Castro could meet. Jacobson said the talks were "productive and encouraging," according to Reuters. President Obama announced a new direction for US-Cuba relations in December. Some travel and trade restrictions between the two countries were lifted last month. However, the US economic and financial embargo against Cuba largely remains in place since its inception in October 1960, beginning shortly after Fidel Castro led a popular socialist revolution, challenging US hegemony in the Western Hemisphere. Previously, Cuba called for removal from the US list of state sponsors of terror before any official normalization of diplomatic relations. The designation, Cuba has argued, bars the nation from doing business with certain banks which face punitive fines or forfeitures for working with nations on the terror-sponsor list. President Castro reaffirmed last month his nation’s willingness to normalize relations with the US, but stressed that the embargo must first be lifted. "The main problem has not been resolved: the economic, commercial and financial blockade, which causes huge human and economic damage and is a violation of international rights," Castro said at a Latin American summit in Costa Rica. The Cuban president also noted that the US must return Guantanamo – which has been under US control for over a century – to Cuba before full rapprochement. The White House scoffed at the request. “I think what [Castro’s] comments highlight is there are pretty clear differences between establishing diplomatic relations and carrying out the longer process of normalizing relations,” said White House press secretary Josh Earnest. As for embassy functions, US officials say they are particularly important, since they would allow US diplomats to move unmitigated around Cuba and meet with anyone, including political opponents of the Castros. "Both of us have to come to the table in the spirit of getting to an agreement on these things, and not putting so many obstacles in the way that are not linked directly to how we function as diplomats in each other's countries," a State Department official said. In mid-December, both Raul Castro and Obama announced during concurrent news conferences that the two nations would try to start anew after conflicting ideologies led to a split, then sanctions, more than a half-century earlier.